Aeroflot group, Russia’s largest airline consortium, has experienced continuous traffic growth at the start of this year, albeit at a somewhat slower rate. In the first two months of the year, Aeroflot Group (which includes Aeroflot, Rossiya Airlines, low-cost carrier Pobeda Airlines and regional operator Aurora Airlines) collectively carried 7.1 million passengers, up 6.1% year-on-year. National carrier Aeroflot carried 4.7 million passengers in the period, a year-on-year increase of 4.8%. The group’s and the leading airline’s RPKs (revenue passenger kilometers) increased 6.3 year-on-year and 4.1% respectively. Available seat kilometres (ASKs) rose by 5.6% year-on-year for the group and by 5.9% year-on-year for the airline. The group carried 3.4 million passengers in February, up 4.3% year-on-year, although Russia’s flag carrier itself transported 2.3 million, a year-on-year increase of only 2.9%. The group on the whole and the airline in particular saw their February RPKs up 4.9% and 3% up, respectively. ASKs rose by 4.5% for the group and by 5.1% for Aeroflot. On domestic routes, the group carried 4.4% more passengers year-on-year and had 5.8% more RPC, while its ASKs grew by 0.7% year-on-year. Airline passenger numbers and RPKs increased by 4.8% and 4.5% year-on-year, whise its ASK grew by 3.4%. For domestic routes, the passenger load factors increased by 3.9 percentage points year-on-year to 80% for Aeroflot Group, and by 0.9 p.p. year-on-year to 79.3% for Aeroflot. In the same period, the number of passengers carried on the group’s international routes increased by 4.3% year-on-year. RPKs grew by 4.4%, while capacity grew by 7.1%. The number of passengers carried by Aeroflot itself on international routes increased by 1.3%. RPKs grew by 2.3%, and ASKs by 5.9%, in the first two months ofthe year. Passenger load factor on international routes decreased by 2.0 p.p. year-on-year to 77% for Aeroflot Group, and by 2.6 p.p. to 74.6% for Aeroflot. 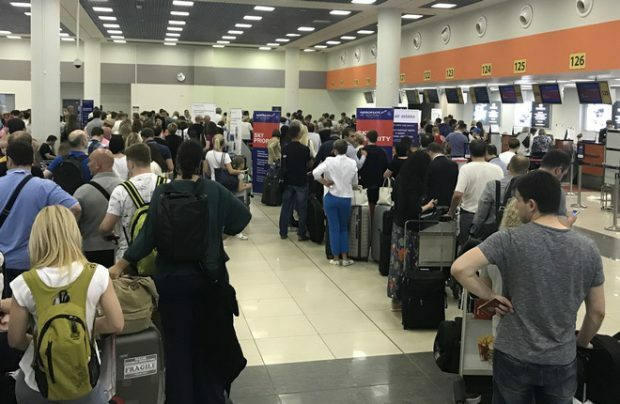 According to Aeroflot, the decrease in the international passenger load factor was the result of increased flight frequencies, primarily on European and US routes. Other factors might include a significant increase in February 2017’s passenger load factors. In an effort to implement its fleet modernisation program, Aeroflot Group added five aircraft in February, including two Airbus A321s, one Boeing 737-800 and one Sukhoi Superjet 100 went to Aeroflot airline, with one B737-800 delivered to low-cost sister carrier Pobeda. As of 28 February 2018, the group’s overall fleet had grown to 332 aircraft. Aeroflot’s own fleet list totalled 230 aircraft, with one Airbus A320 and one Airbus A321 having been phased out in the month.